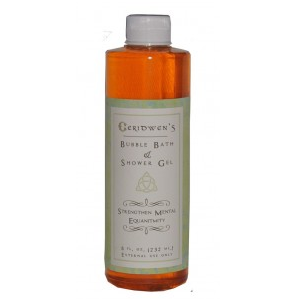 Ceridwen’s Shower Gels have been handcrafted from a family formula that has been passed down for thirty years using the healing waters that flow from the same geothermal activity as in the healing spas in Arkansas. They are hand blended at just the right time of the day and phase of the moon to bring the perfect energy to your bath or shower experience. Individual Bath Gels are formulated for specific intentions. Custom Shower Gels and Bubble Bath can be custom made from a selection of over 1,600 oils and may be special ordered. Shower Gels grew from a need in our fast-paced world to cleanse the unseen part of us day or night when we don’t have the time to luxuriate in a bath. Men LOVE our Shower Gels! The same gel can be used for a luxurious soak in a Bubble Bath or for the kids to splash around in a fun Bubble Bath with a set intention! Amethyst Gel – Stimulates the crown chakra to an awareness of higher knowledge and consciousness. Anti-Depression Gel – Brings you states of clarity and understanding. Bringing forth joy into one’s life. Attract A Lover Gel – Brings forth new love and possibilities. Aura Cleanse Gel – Cleanses energetic bodies. Brings forth new light. Beauty Gel – This is a reflection, reminds you and shows you the beauty within. Gold Light Gel – Spiritual energy, divine inspiration, divine protection and guidance. Attraction and abundance. Protect A Child Gel – To shield and protect a child or your inner child from spiritual and physical harm. Prosperity Gel – To draw money and wealth in all aspects of your life. Protection Gel – Provides Divine protection for persons, objects and/or places. Positive Vibrations Gel -An anti bad vibe shield; enhances peace love and joy. Psychic Protection Gel – Enhance your ability to create energetic protection for yourself as you work with other realms. Psychic protection is important for everyone who is doing spiritual or psychic development work. Relaxation Gel – Leave your cares and stress behind. Releasing Gel – Clears blockages, allowing you to let go of all that no longer serves your highest self. Return To Me Gel – Brings back someone who is gone from you. Rose Quartz Gel – To open up your heart chakra to unconditional love. Selenite Shower Gel – Assists in clarifying the mind and focusing awareness. Self-Acceptance Gel – Enhances self worth and self love. Star Gel – Connect with the astral bodies and enlighten to your highest self. STHRT Gel – Use to release Stress and Tension and to enhance Healing, Relaxation, and Tranquility. Strengthen Mental Equanimity – Use to sharpen focus, comprehension, and retention. Success Gel – Brings supportive energy to pursue your life’s desire. Success In Life Gel – Brings supportive energy to pursue your life’s passion. Success In The Arts Gel – Brings supportive energy to pursue your artistic self. Tranquility Gel – Use to develop inner peace and tranquility. True Love Gel – Use to draw true love and affection. Unconditional Love Gel – Provides you with an abundance of love in all aspects of your life.